Sets fast - dries transparent. Economical - a little goes a long way. High resin content - for consistency and strength. For the home. 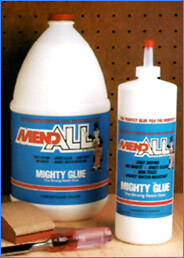 Where you need a good glue for small jobs. For the basement shop. Where fast setting is important. For the carpenter. Where a glue of better than average strength is needed. For the small woodworking shop. Where highest tensile strength is required. For industry. Where you need quality plus economy.